Groupe Sipromad Real Estate handles the Group's real estate property and contributes to the Group's growth by offering professional real estate and facility management services in collaboration with all the entities in Groupe Sipromad. A fully dedicated team to support the sustainable growth of Groupe Sipromad. SIDM (Société Immobilier Des Mascareignes), is a division of the Group that is responsible for all aspects of real estate management for the buildings of commercial office, industrial, land and retail space (30,000 sq. meters of office and 200,000 sq. meters of land and property). This volume and range creates an extensive depth of knowledge and expertise in the real estate management, enabling us to operate buildings efficiently, consistently, and to the highest standard. Out strategic approach enables us to maximize property value while delivering a superior level of service to our tenants. Investing in commercial real estates, property and facility management. Dedicated to buying, building and developing new estates in harmony with our values. Committed to giving advice & expertise to Groupe Sipromad companies for the management of their offices and industrial real estate. 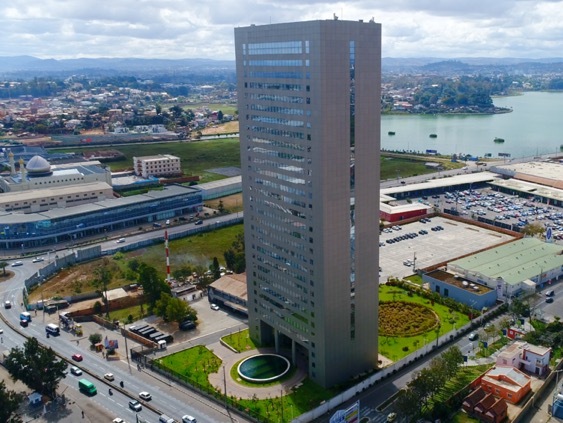 Located in the heart of Antananarivo, minutes away from major business centers in the capitol allowing for optimal accessibility to clients and partners. 19,200sq. meters of office space, 30 floors, 100meters in height, certified anti-earthquake and anticyclone. Optimal working conditions including security badges for entry and guards stationed at all entrances and exits. Air conditioning managed by the building's systems operator, mechanized fresh air flow, fire safety systems according to High Rise Building Standard, six KONE Elevators, one car park with 250 available spots. Building is fully linked by Fiber Optic Cables backed by a second line. Each floor has a facility for connecting cameras if needed.